Streaming media is multimedia that is constantly received by and presented to an end-user while being delivered by a provider. The verb "to stream" refers to the process of delivering or obtaining media in this manner;[clarification needed] the term refers to the delivery method of the medium, rather than the medium itself, and is an alternative to file downloading, a process in which the end-user obtains the entire file for the content before watching or listening to it. A client end-user can use their media player to start playing digital video or digital audio content before the entire file has been transmitted. Distinguishing delivery method from the media distributed applies specifically to telecommunications networks, as most of the delivery systems are either inherently streaming (e.g. radio, television, streaming apps) or inherently non-streaming (e.g. books, video cassettes, audio CDs). For example, in the 1930s, elevator music was among the earliest popular music available as streaming media; nowadays Internet television is a common form of streamed media. The term "streaming media" can apply to media other than video and audio, such as live closed captioning, ticker tape, and real-time text, which are all considered "streaming text". Live streaming is the delivery of Internet content in real-time much as live television broadcasts content over the airwaves via a television signal. Live internet streaming requires a form of source media (e.g. a video camera, an audio interface, screen capture software), an encoder to digitize the content, a media publisher, and a content delivery network to distribute and deliver the content. Live streaming does not need to be recorded at the origination point, although it frequently is. There are challenges with streaming content on the Internet. If the user does not have enough bandwidth in their Internet connection, they may experience stops, lags, or slow buffering of the content. Some users may not be able to stream certain content due to not having compatible computer or software systems. Some popular streaming services include the video sharing website YouTube, Twitch, and Mixer, which live stream the playing of video games. Netflix and Amazon Video stream movies and TV shows, and Spotify, Apple Music and TIDAL stream music. 2.2.1 The fight for intellectual property rights: A&M Records, Inc. v. Napster, Inc. In the early 1920s, George O. Squier was granted patents for a system for the transmission and distribution of signals over electrical lines, which was the technical basis for what later became Muzak, a technology streaming continuous music to commercial customers without the use of radio. Attempts to display media on computers date back to the earliest days of computing in the mid-20th century. However, little progress was made for several decades, primarily due to the high cost and limited capabilities of computer hardware. From the late 1980s through the 1990s, consumer-grade personal computers became powerful enough to display various media. The primary technical issues related to streaming were having enough CPU power bus bandwidth to support the required data rates, creating low-latency interrupt paths in the operating system to prevent buffer underrun, and enabling skip-free streaming of the content. However, computer networks were still limited in the mid-1990s, and audio and video media were usually delivered over non-streaming channels, such as by downloading a digital file from a remote server and then saving it to a local drive on the end user's computer or storing it as a digital file and playing it back from CD-ROMs. 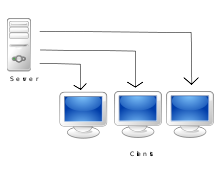 In 1991 the first commercial Ethernet Switch (see Network Switch) was introduced, which enabled more powerful computer networks leading to the first streaming video solutions (see Business developments below) used by schools and corporations such as expanding Bloomberg Television worldwide. In the mid 1990s the World Wide Web was established, but streaming audio would not be practical until years later. During the late 1990s and early 2000s, users had increased access to computer networks, especially the Internet. During the early 2000s, users had access to increased network bandwidth, especially in the "last mile". These technological improvements facilitated the streaming of audio and video content to computer users in their homes and workplaces. There was also an increasing use of standard protocols and formats, such as TCP/IP, HTTP, HTML as the Internet became increasingly commercialized, which led to an infusion of investment into the sector. The band Severe Tire Damage was the first group to perform live on the Internet. On June 24, 1993, the band was playing a gig at Xerox PARC while elsewhere in the building, scientists were discussing new technology (the Mbone) for broadcasting on the Internet using multicasting. As proof of PARC's technology, the band's performance was broadcast and could be seen live in Australia and elsewhere. In a March 2017 interview, band member Russ Haines stated that the band had used approximately "half of the total bandwidth of the internet" to stream the performance, which was a 152-by-76 pixel video, updated eight to twelve times per second, with audio quality that was "at best, a bad telephone connection". The term "streaming" was first used for tape drives made by Data Electronics Inc. for drives meant to slowly ramp up and run for the entire track; the slow ramp times resulted in lower drive costs, making a more competitive product. "Streaming" was applied in the early 1990s as a better description for video on demand and later live video on IP networks. It was first done by Starlight Networks for video streaming and Real Networks for audio streaming. At the time such video was usually referred to as "store and forward video", which was misleading nomenclature. The first commercial streaming product appeared in late 1992 and was named StarWorks. StarWorks enabled on demand MPEG-1 full motion videos to be randomly accessed on corporate Ethernet networks. Starworks was from Starlight Networks, who also pioneered live video streaming on Ethernet and via Internet Protocol over satellites with Hughes Network Systems. Other early companies who created streaming media technology include RealNetworks (then known as Progressive Networks) and Protocomm both prior to wide spread World Wide Web usage and once the web became popular in the late 90s, streaming video on the internet blossomed from startups such as VDOnet, acquired by RealNetworks, and Precept, acquired by Cisco. In 2000 Industryview.com launched its "world's largest streaming video archive" website to help businesses promote themselves. Webcasting became an emerging tool for business marketing and advertising that combined the immersive nature of television with the interactivity of the Web. The ability to collect data and feedback from potential customers caused this technology to gain momentum quickly. Around 2002, the interest in a single, unified, streaming format and the widespread adoption of Adobe Flash prompted the development of a video streaming format through Flash, which was the format used in Flash-based players on many popular video hosting sites, such as YouTube, now defaulting to HTML5 video. Increasing consumer demand for live streaming has prompted YouTube to implement a new live streaming service to users. The company currently also offers a (secured) link returning the available connection speed of the user. "Streaming creates the illusion—greatly magnified by headphone use, which is another matter—that music is a utility you can turn on and off; the water metaphor is intrinsic to how it works. It dematerializes music, denies it a crucial measure of autonomy, reality, and power. It makes music seem disposable, impermanent. Hence it intensifies the ebb and flow of pop fashion, the way musical 'memes' rise up for a week or a month and are then forgotten. And it renders our experience of individual artists/groups shallower." A media stream can be streamed either "live" or "on demand". Live streams are generally provided by a means called "true streaming". 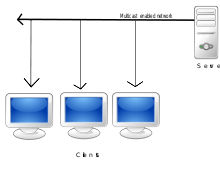 True streaming sends the information straight to the computer or device without saving the file to a hard disk. On-demand streaming is provided by a means called progressive streaming or progressive download. Progressive streaming saves the file to a hard disk and then is played from that location. On-demand streams are often saved to hard disks and servers for extended amounts of time; while the live streams are only available at one time only (e.g., during the football game). Streaming media is increasingly being coupled with use of social media. For example, sites such as YouTube encourage social interaction in webcasts through features such as live chat, online surveys, user posting of comments online and more. Furthermore, streaming media is increasingly being used for social business and e-learning. Due the popularity of the streaming medias, many developers have introduced free HD movie streaming apps for the people who use smaller devices such as tablets and smartphones for everyday purposes. One of the movie streaming industry's largest impacts was on the DVD industry, which effectively met its demise with the mass popularization of online content. The rise of media streaming caused the downfall of many DVD rental companies such as Blockbuster. In July 2015 the New York Times published an article about Netflix's DVD services. It stated that Netflix was continuing their DVD services with 5.3 million subscribers, which was a significant drop from the previous year. On the other hand, their streaming services had 65 million members. In a March 2016 study assessing the “Impact of Movie Streaming over traditional DVD Movie Rental,” it was found that respondents did not purchase DVD movies nearly as much anymore, if at all, as streaming had taken over the market. According to the study, viewers did not find movie quality to be significantly different between DVD and online streaming. Issues that respondents believed needed improvement with movie streaming included functions of fast forwarding or rewinding, as well as search functions. The article highlighted that the quality of movie streaming as an industry would only increase in time, as advertising revenue continued to soar on a yearly basis throughout the industry, providing incentive for quality content production. Music streaming is one of the most popular ways in which consumers interact with streaming media. In the age of digitization, the private consumption of music transformed into a public good largely due to one player in the market: Napster. Not only did this development disrupt the music industry by making songs that previously required payment to acquire freely accessible to any Napster user, it demonstrated the power of P2P networks in turning any digital file into a public, shareable good. For the brief period of time that Napster existed, mp3 files fundamentally changed as a type of good. Songs were no longer financially excludable - barring access to a computer with internet access - and they were not rival, meaning if one person downloaded a song it did not diminish another user from doing the same. Napster, like most other providers of public goods, faced the problem of free riding. Every user benefits when an individual uploads an mp3 file, but there is no requirement or mechanism that forces all users to share their music. Thus, Napster users were incentivized to let others upload music without sharing any of their own files. This structure revolutionized the consumer’s perception of ownership over digital goods - it made music freely replicable. Napster quickly garnered millions of users, growing faster than any other business in history. At the peak of its existence, Napster boasted about 80 million users globally. The site gained so much traffic that many college campuses had to block access to Napster because it created network congestion from so many students sharing music files. The advent of Napster sparked the creation of numerous other P2P sites including LimeWire (2000), BitTorrent (2001), and the Pirate Bay (2003). The reign of P2P networks was short lived. The first to fall was Napster in 2001. Numerous lawsuits were filed against Napster by various record labels, all of which were subsidiaries of Universal Music Group, Sony Music Entertainment, Warner Music Group, or EMI. In addition to this, the Recording Industry Association of America (RIAA) also filed a lawsuit against Napster on the grounds of unauthorized distribution of copyrighted material, which ultimately led Napster to shutting down in 2001. In an interview with Gary Stiffelman, who represents Eminem, Aerosmith, and TLC, he explained why Napster was a problem for record labels: loss in revenue. In an interview with the New York Times, Stiffelman said, “I’m not an opponent of artists’ music being included in these services, I’m just an opponent of their revenue not being shared." The fight for intellectual property rights: A&M Records, Inc. v. Napster, Inc. The lawsuit A&M Records, Inc. v. Napster, Inc. fundamentally changed the way consumers interact with music streaming. It was argued on October 2, 2000 and was decided on February 12, 2001. The Court of Appeals for the Ninth Circuit ruled that a P2P file sharing service could be held liable for contributory and vicarious infringement of copyright, serving as a landmark decision for intellectual property law. The first issue that the Court addressed was “fair use,” which says that otherwise infringing activities are permissible so long as it is for purposes “such as criticism, comment, news reporting, teaching [...] scholarship, or research.” Judge Beezer, the Judge for this case, noted that Napster claimed that its services fit “three specific alleged fair uses: sampling, where users make temporary copies of a work before purchasing; space-shifting, where users access a sound recording through the Napster system that they already own in audio CD format; and permissive distribution of recordings by both new and established artists.” Judge Beezer found that Napster did not fit these criteria, instead enabling their users to repeatedly copy music, which would affect the market value of the copyrighted good. The injunction ordered against Napster ended the brief period in which music streaming was a public good - non-rival and non-excludable in nature. Other P2P networks had some success at sharing mp3’s, though they all met a similar fate in court. The ruling set the precedent that copyrighted digital content cannot be freely replicated and shared unless given consent by the owner, thereby strengthening the property rights of artists and record labels alike. As music streaming platforms have become more prevalent in the U.S., music piracy rates have fallen. Piracy rates are calculated as a function of U.S. total population. This data was sourced from the Digital Media Association's (DiMA) annual report from March 2018. Although music streaming is no longer a freely replicable public good, streaming platforms such as Spotify, Deezer, Apple Music, SoundCloud, and Prime Music have shifted music streaming to a club-type good. While some platforms, most notably Spotify, give customers access to a freemium service that enables the use of limited features for exposure to advertisements, most companies operate under a premium subscription model. Under such circumstances, music streaming is financially excludable, requiring that customers pay a monthly fee for access to a music library, but non-rival, since one customer’s use does not impair another’s. Music streaming platforms have grown rapidly in popularity in recent years. Spotify has over 207 million users, as of January 1st 2019, in 78 different countries, Apple Music has about 60 million, and SoundCloud has 175 million. All platforms provide varying degrees of accessibility. Apple Music and Prime Music only offer their services for paid subscribers, whereas Spotify and SoundCloud offer freemium and premium services. Napster, owned by Rhapsody since 2011, has resurfaced as a music streaming platform offering subscription based services to over 4.5 million users as of January 2017. As music streaming providers have proliferated and competition has pushed the price of subscriptions down, music piracy rates have also fallen (see chart to the right). Useful – and typical – applications of the "streaming" concept are, for example, long video lectures performed "online" on the Internet. An advantage of this presentation is that these lectures can be very long, although they can always be interrupted or repeated at arbitrary places. There are also new marketing concepts. For example, the Berlin Philharmonic Orchestra sells Internet live streams of whole concerts, instead of several CDs or similar fixed media, by their so-called "Digital Concert Hall" using YouTube for "trailing" purposes only. These "online concerts" are also spread over a lot of different places – cinemas – at various places on the globe. A similar concept is used by the Metropolitan Opera in New York. Many successful startup ventures have based their business on streaming media. There also is a livestream from the International Space Station. Media that is live streamed can be recorded through certain media players such as VLC player, or through the use of a Screen Recorder. Live-streaming platforms such as Twitch may also incorporate a video on demand system that allows automatic recording of live broadcasts so that they can be watched later. ^ "Schou FishCam". 16 December 2014. Archived from the original on 16 December 2014. ^ "US Patent 1,641,608". Google Patents. ^ "History of the Internet Pt. 1 - The First Live Stream". From YouTube.com. Internet Archive - Stream Division. 5 April 2017. Retrieved 2018-01-13. ^ "Cyberian Rhapsody". Billboard. United States: Lynne Segall. 17 Feb 1996. ^ "On buffer requirements for store-and-forward video on demand service circuits". IEEE. ^ "CompCon Spring 1993-StarWorks-a video applications server". ^ "Starlight Networks and Hughes Network Systems". ^ Hebert, Steve (November 2000). "Streaming Video Opens New Doors". Videography. p. 164. ^ Reinstein, Bill (25 June 2001). "Webcasts Mature as Marketing Tool". DM News. p. 24. ^ "YouTube now defaults to HTML5 <video>". YouTube Engineering and Developers Blog. Retrieved 2018-02-20. ^ Josh Lowensohn (2008). "YouTube to Offer Live Streaming This Year". Retrieved 2011-07-23. ^ "YouTube Video Speed History". Archived from the original on April 26, 2012. Retrieved April 30, 2012. ^ "News and Notes on 2015 RIAA Shipment and Revenue Statistics" (PDF). RIAA. Retrieved 5 January 2017. ^ "Streaming made more revenue for music industry in 2015 than digital downloads, physical sales". The Washington Times. Retrieved 5 January 2017. ^ Shaw, Lucas (20 September 2016). "The Music Industry Is Finally Making Money on Streaming". Bloomberg. Retrieved 5 January 2017. ^ "The Sky is Rising", Masnick, M., Ho, M., Hung, J., Beadon, L.. Accessed 8 February 2015. ^ Christgau, Robert (November 20, 2018). "Xgau Sez". robertchristgau.com. Archived from the original on December 10, 2018. Retrieved November 21, 2018. ^ Kellner, Scott (28 February 2013). "The Future of Webcasting". INXPO. Archived from the original on 3 July 2013. Retrieved 15 May 2013. ^ Umstead, R. Thomas (5 June 2017). "Horowitz: Streaming Is the New Normal". Broadcasting & Cable: 4. ^ a b "JIII.org" (PDF). ^ "Ashes to ashes, peer to peer: An oral history of Napster". Fortune. Retrieved 2019-03-11. ^ May 31, Benny Evangelista on; PM, 2009 at 8:00 (2009-06-01). "An interview with Napster's Shawn Fanning". The Technology Chronicles. Retrieved 2019-03-11. ^ a b expertise, Mark Harris Brings music; Producer, Including a Background as a Music; composer; Articles, To Digital Music. "The History of Napster: Yes, It's Still Around". Lifewire. Retrieved 2019-03-11. ^ Strauss, Neil (2002-02-18). "Record Labels' Answer to Napster Still Has Artists Feeling Bypassed". The New York Times. ISSN 0362-4331. Retrieved 2019-03-11. ^ a b "Case Study: A&M Records, Inc. v. Napster, Inc. - Blog | @WashULaw". onlinelaw.wustl.edu. 2013-08-01. Retrieved 2019-03-11. ^ a b c "A&M RECORDS, INC. v. NAPSTER, INC., 239 F.3d 1004 (9th Cir. 2001)". www.law.cornell.edu. Retrieved 2019-03-11. ^ "Digital Media Association Annual Report" (PDF). March 2018. ^ "Spotify 2018 Quarter 4 Letter to Shareholders" (PDF). Spotify. ^ McIntyre, Hugh. "The Top 10 Streaming Music Services By Number Of Users". Forbes. Retrieved 2019-03-11. ^ "Napster Proves That Streaming Music Can Be Profitable". Digital Music News. 2018-08-22. Retrieved 2019-03-11. ^ a b c "Global Music Report 2018: Annual State of the Industry" (PDF). GMR. 2017. ^ Staples, Kim (20 May 2016). "How to watch live TV online: The complete guide". broadbandchoices. Retrieved 1 October 2016. ^ "Streaming the London Olympic Games with the "Go Live Package" from iStreamPlanet and Haivision | iStreamPlanet". www.istreamplanet.com. Retrieved 2015-11-11. ^ Ch. Z. Patrikakis, N. Papaoulakis, Ch. Stefanoudaki, M. S. Nunes, "Streaming content wars: Download and play strikes back" presented at the Personalization in Media Delivery Platforms Workshop, [218 – 226], Venice, Italy, 2009. ^ "The Berliner Philharmoniker's Digital Concert Hall". Digital Concert Hall. ^ "Video Streaming Startups". TechCrunch. Retrieved 2015-03-12. ^ "High Definition Earth-Viewing System (HDEV)". NASA. Retrieved 26 December 2016. ^ "ISS HD Earth Viewing Experiment". Retrieved 26 December 2016. ^ Smith, Chris (5 June 2014). "Pirating copyrighted content is legal in Europe, if done correctly". bgr.com. Boy Genius Report. This page was last edited on 16 April 2019, at 04:14 (UTC).